The temperature in the next 24 hours is supposed to drop over 35 degrees. That's the different between highs - not between a high and a low. Welcome to fall. The worry and planning, fuss and frenzy thermometer is supposed to have an equivalent jump in the opposite direction. Less than two weeks until crazy event-of-your-life madness. And Otto snuggles on the couch, happy we're home, snoozing and drooling. It's dark by eight and Charlie is making Indian food from a jar. And it smells amazing. This weekend we're going to go buy fireworks novelty sparklers 40 minutes away in Mountain Home. Our house is being overwhelmed by boxes. Boxes and box stuffing in every room. It's a big cat fort. We still have windows open in the living room, and I'm debating pulling out the box of winter sweaters--folded and smelling like stiff, scratchy, wool. Is it bad luck to listen to our reception mix before the wedding? If it is, don't say anything to me about it. My wedding band isn't here yet. We ordered it from a catalog, and it's supposed to be here soon. There's cat food on the floor in the kitchen. It's been months since we've taken a walk down along the river. More to come on this one, I promise. Over the long Labor Day weekend, Charlie and I decided to take a break from wedding-land and set out on a three-day backpacking trip up into the Sawtooth National Wilderness Area. 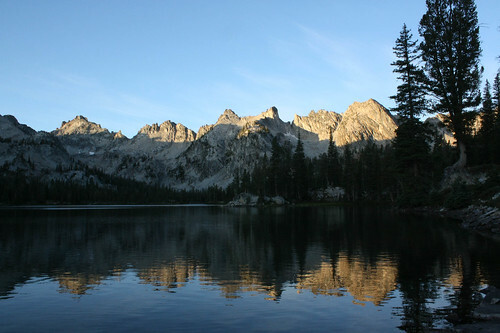 It was a classic Sawtooth trip in the eastern part of the mountains, about 15 minutes from Stanley, Idaho. 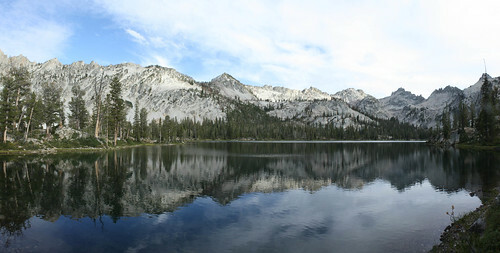 We hiked the spectacular Toxaway Lake-Alice Lake loop. With an unanticipated few extra miles in the beginning (due to a trail-head goof), in all we hiked 20.2 miles in three days. We climbed (and then, of course, descended) about 2,900 feet in all. Our highest point, crossing Snowyside Pass, was at about 9,400 feet. I have a million pictures to sort through (surprise, surprise), but here are a couple early favorites that I can't help but share. These colors are completely authentic - no post-process color or saturation tweaking at all. Both shots are from where we stayed on night 2, Alice Lake. If you click on the pictures, it should take you to flickr, where you can view larger sizes.